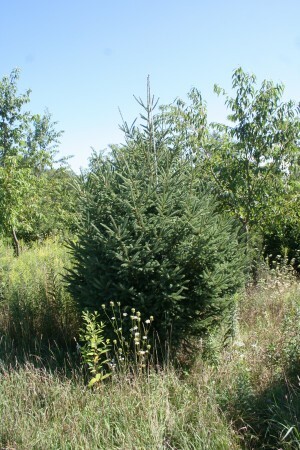 White Spruce about nine feet tall When we started Dexter Tree Farm in 2008 we had a large existing inventory of White Pines and White Spruces that were just approaching marketable size. As sales picked up the numbers were so large that we didn’t see the need to plant more. Now we still have quite a few of those original trees but they have grown into quite large trees. 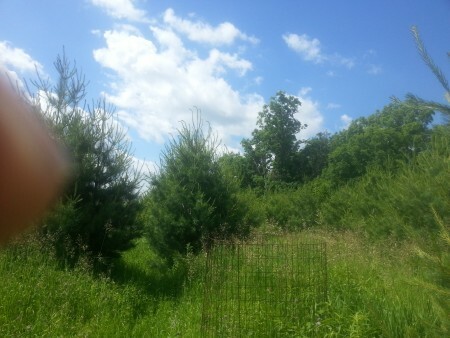 We have been planting new trees for the last couple of years but we still have a large gap between the large trees and the small trees. If you want 15 to 20 foot evergreen trees and are willing to pay for the trees and the cost to move them we have a good supply. If you want a simple inexpensive easy way to plant evergreens that will grow into large trees in a few years we have a reasonably good supply. What we don’t have at this time are 6 to 12 foot trees that you can plant yourself. We are working to close the gap. We should start selling these trees in the next year or two.